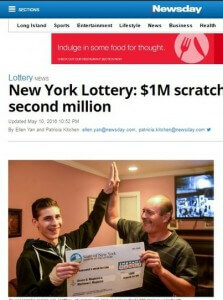 New York Man Wins $1 Million - Again! When people casually say that ” some people have all the luck” they may be referring to someone much like Bruce Magistro of Lindenhurst. The guy has just won $1,000 a week for life which equates to no less than a million dollars. But that is after having already won an Extreme Cash prize of a million dollars four years ago. The odds of having such luck is very low but Magistro’s son Brian may have an explanation – he believes it is his mother looking out for them from the afterlife.